In this blog post I share some of my current thinking about the role the Creative Process plays in shaping authentic, exciting, engaging teaching and learning opportunities in our classrooms and schools. The various stages within the Creative Process, outlined in the diagram above, are not linear in nature. It is not a requirement for your creative journey to start at the top of the circle (Challenging and Inspiring) and progress in a clockwise direction through the various phases or stages. The double headed arrows that lead in and out of the outer circles remind us that learning can (and often does) involve multiple twists and turns, moving in and out of the circle via self-reflection, conversations and interactions with others along the way. As the Creative Process more and more deeply centers itself within my thinking and in my practice, I realize how strategically it helps me navigate and think about curriculum. I no longer feel bound to simply follow a set of curriculum expectations in a linear, hierarchical fashion (teacher driven, top down learning). Instead, I am freed up to seek out, with the students, the essential essence of the learning (held within those expectations) and re-frame the learning as a Challenge or Inspiration. By re-framing this learning together with the students, we then have a mutual understanding about the significance of what we are embarking on together and its relationship to our world and its inter-connectedness. From there we can dive fully into the process of discovering and uncovering new learning together. By thinking of the curriculum in this way, new possibilities for how we design and shape learning opportunities within our classrooms and our schools can emerge–rich, engaging, deep thinking learning that so many of us are searching for through project-based and passion-based learning. How can we improve creative and critical thinking skills of our students by differentiating our instruction (content, process, product, environment) within the Creative Process? “In an ever-changing world, we are faced with a range of events and perspectives that unfold daily. If the earth could sing, what would be the songs? 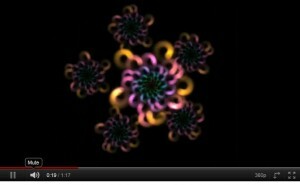 How might the songs of the earth reflect the events and perspectives that have unfolded around us? Some of these songs might be joyful, filled with beauty and celebration, while others may be shrouded in destruction, devastation, and despair. This unit attempts to seek out the many voices of our earth and its inhabitants, offering words of wisdom, understanding, and hope through the art works that students create. As I think back on the work we did during this past year, coming together to co-create the unit One Earth, Many Voices, I realize that the Creative Process was our compass, our navigational guide that helped us chart where and how teaching and learning would progress. It helped us be responsive and present in the moment with our students, and helped us engage in more authentic “ways of knowing” as we ventured on this learning journey together. Another perspective on the Creative Process that I would like to share with you can be found in my Spaces for Innovation blog post, #BMEDay: Releasing the Possibilities. This post reflects on my participation in an event called BMEday (Beginning/Middle/End), a Social Media experiment that was posted on Twitter, August 13th, 2011. 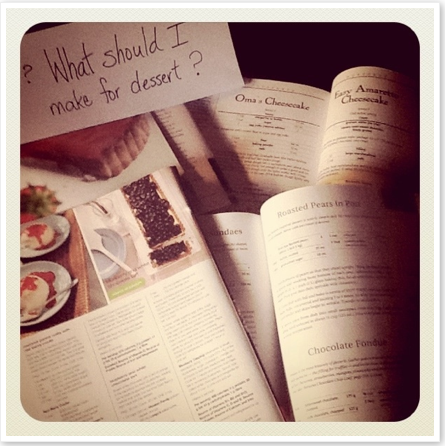 The first photograph represents the “minds on” stage of the Creative Process, Challenge and Inspiration, as captured by the question in the photograph: “What should I make for dessert?” The recipe books in the background suggest the Imagining and Generating stage, the thinking about and considering all of the possibilities for what to make. The Planning and Focusing stage emerged while I was reading the various recipes and carefully considering the ingredients available in my pantry and fridge, the timelines required, the equipment needed, and my knowledge of my audience’s (my family’s) preferences. As a metaphor for teaching and learning, this beginning photograph represents the importance of having the end in mind, more specifically, knowing what you want to be able to do, what skills and knowledge will be necessary to accomplish the task at hand. The second photograph captures the “doing” stage, where all the action and messiness takes place: Exploring and Experimenting, Producing Preliminary Work and Revising and Refining. 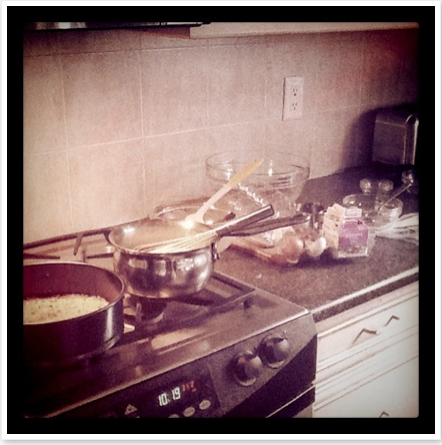 Throughout these stages, I actively explored cooking techniques all the while carefully following the steps as outlined in the recipe in order to produce a dessert I had never made before. Tasting and adjusting along the way, I refined and revised some important choices related to the ingredients, utilizing my aesthetic to guide my decisions. In terms of teaching and learning, this “doing and messiness” stage of the Creative Process is where real learning occurs. It is filled with the anticipation of the final product that is gradually emerging before one’s eyes. This is a stage filled with challenge and risk taking because it often involves trying out new techniques in order to complete a task. The final photograph suggests the last two stages of the Creative Process- Presenting, Performing, Sharing and Reflecting and Evaluating. 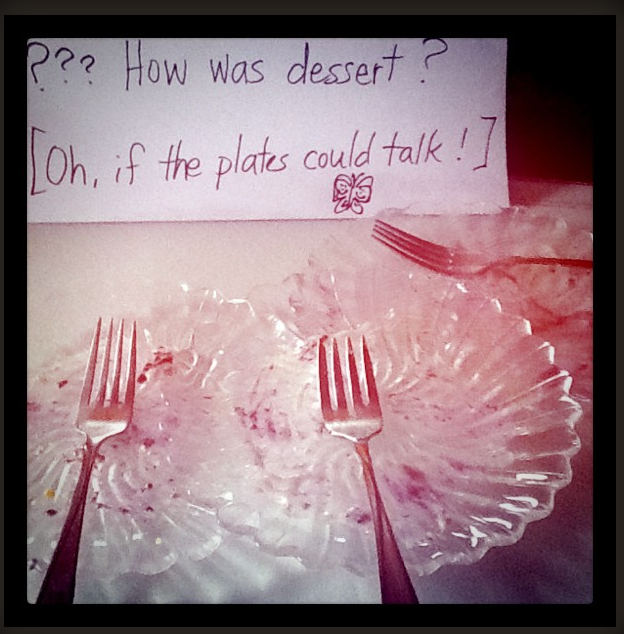 In showing the empty plates accompanied by the caption: “How was the dessert? Oh if only the plates could talk…”, I was suggesting that the dessert was a success based on the feedback (regarding the overall quality of the dessert) that I received from my audience. In terms of teaching and learning, this final stage of the Creative Process cannot be done in isolation from the learner. Its power lies in the conversations and interactions with others, elevating ones learning to new levels because it involves sharing beyond oneself. An additional way one might consider infusing the Creative Process into teaching and learning can be explored in the website I created for Visual Arts teachers. The website SPACES in the Arts provides examples of a wide range of global issues, topics and concerns, as well as artists and their art works, all featured for consideration and exploration. The posts in Spaces in the Arts are framed as Challenges or Inspirations for teachers and students to engage with in order to lead them into the creation of their own works of art and/or representations of their thinking and learning. Within each blog post I frame questions that are intended to help teachers think about how they might use a particular artist’s artwork, art form, and key messages to precipitate learning. I frame questions to help students think about their own views and invite them to consider how these might be further explored, understood, and represented through their own creative voice. I hope that I have provided some insights into how the Creative Process has shaped my teaching and learning and that you have made some connections about how the Creative Process might enhance your circumnavigation of the world of teaching and learning! I look forward to hearing your thoughts, questions, and comments.